Our aluminum corner rod kit is pre-packaged to create one of 3 different configurations. It is made of non corrosive aluminum and is .98in / 25mm in diameter. This corner rod is designed and produced by well-known German brand Kleine Wolke, established in 1968, and is backed by their quality guarantee. Wall connections for the corner rod are made with screws which are included in the package. The kit includes enough pieces to create one of 3 configurations including a "U" shape and two "L" shape options one for a shower stall or one for a standard tub. The kit items are shown on the product page along with a diagram of each possible configuration and associated dimensions. The straight pieces in the corner rod kit can be easily cut to size with a hacksaw. You can use our ceiling support with your existing rod. It will support a 1 inch diameter corner rod. Our ceiling support is the same material and diameter .98in / 25mm as the corner rod. It also can be cut to meet your required length. All hardware and connections necessary to install the ceiling rod are included. The diagram shows the shower curtain sliding freely around the elbow / corner. This is possible with "C" shaped shower curtain rings. If you do not have "C" shaped rings it is NOT a problem. 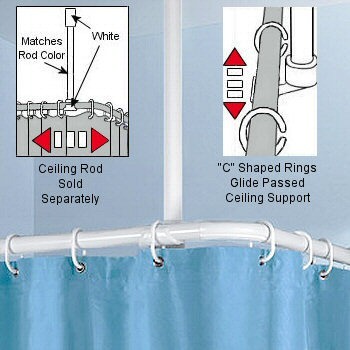 You would simply connect a shower curtain ring on either side of the ceiling support and enter / exit from one side or the other. Need a Longer Ceiling Support? Not a problem. Our Extra Extension Rod will do the trick. It is 35.4 inches and the exact material and diameter of the smaller rod at 23.6 inches that comes with the Ceiling Support. The Extra Extension Rod like all the pieces in our corner rod kit can be cut to the length you need allowing you to drop the rod down further from the ceiling. We sell elbows and additional connector pieces along with extension rods so you can create unique configurations.